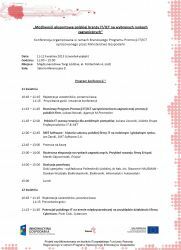 12:00 – 12:45 SMT Software - success story of the Polish IT company on the domestic and global market, Jan Żarski, SMT Software S.A. Participants will be provided with a set of conference materials, 2 lunch breaks and a 2-course lunch. Participants of the conference will be representatives of Polish enterprises from the IT/ICT branch, as well as from business-related and university institutions. 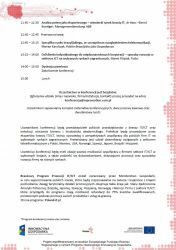 The lectures will be held by IT/ICT experts, who will talk about cooperation perspectives for Polish IT companies on chosen foreign markets. We also expect the participation of journalists related with the ICT sector from Poland, Germany, USA, Norway, Sweden, Japan, Brazil and Spain.